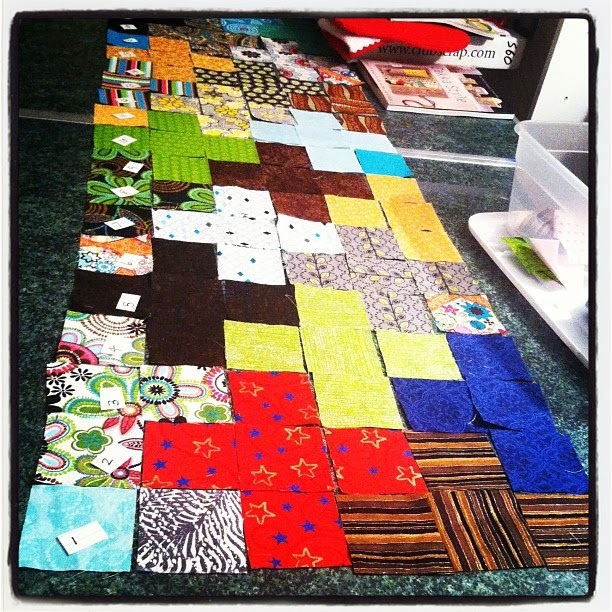 I have had a few finished blocks and/or projects that I had started a while ago and never finished. For some reason I have decided that I want to get them all finished. This flying geese block was supposed to be part of the Craftsy Block of the Month quilt, but I didn't end up putting all the blocks I made into the quilt. So this flying geese block has just been laying around waiting on me to do something with it. Because it was my first time paper piecing one side didn't quite have the 1/4" seam allowance it was supposed to have... so I improvised and cut that off adding a panel of fabric to the bottom. I think it sort of resembles geese diving into the water and coming back out? Ha... I don't know. Once I finished that panel I added another to the top and had to decide if I wanted this to be a tote or a wall hanging. I went for tote, as you can see. The front and back panels are quilted. The inside has a large slip pocket and two smaller pockets for pens or scissors or what have you. I think I'm pretty happy with the way this came out. It finishes at 14 1/2" x 11" and it is 2" deep. The handles are 1 5/8" wide. I think this would be great as a project bag? Put some magazines in the clip pocket maybe. Anyway... I still have two other projects to finish now, my PLUS scrappy table runner and my step-down piecing wall quilt (or table mat). This picture was taken before I pieced it. It is completely pieced, just needs some batting, backing, quilting and binding. And this is a top from Sarah Fielke's Craftsy Class "Big Techniques from Small Scraps". It's called step-down piecing. Looks difficult but it's pretty easy. So that is what I have been and will be working on. I'm also slowly moving from Goodsmiths to Etsy. Not sure how long it will take so for now both shops are active. Also, don't forget to enter to win a Craftsy Class of your choice. March 15th is your last day to enter.